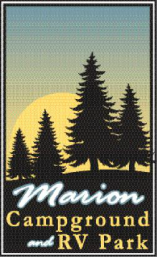 Marion Campground & RV Park welcomes you year-round! Checkout time is 11:00 a.m. Please notify our office before 11:00 a.m. if you would like to extend your stay with us. Please use the designated pet walking area. Pets must remain on a leash. As a courtesy to our other guests, please clean up after your pet. Quiet hours are from 10:00 p.m. to 8:00 a.m. Do not leave grill fires unattended. Please deposit all trash in the provided receptacles. All drain outlets not connected to the sewer must be capped at all times. Please be a good neighbor. Keep your site clean and be considerate to your neighbors. All rates are subject to 7.5% Illinois sales tax.